Packing up my room this week in preparation for the move back home, I stumbled upon a set of index cards on which I had written a set of “rules” for myself at the year’s beginning. The idea was to use them as daily attitude checks, to make sure I was keeping an eye on the way I acted toward and around others during the chaos of the school year. In the interest of self-accountability and hopefully communicating some decent ideas, I thought I’d share a few of them – maybe this summer and this fall I’ll be a little more successful! 1. You’ll always regret what you didn’t say more than what you did. – Life is really short, turns out, and though Honest Abe was quite clear that silence was preferable to speaking out foolishly, he was probably more concerned with being wise and Abe-like and less with being fulfilled in his lifetime. So there. 2. Do not fear what you do not know. – This one is hitting close to home recently. Leaving school this year has been harder than usual, partly because graduation is starting to seem a little too real (and I’m not even done this year, I can only imagine this time next year), and after graduation is… well, it’s growing up. It’s uncertain. And I want to make sure I’m not scared of that just because it’s uncertain. 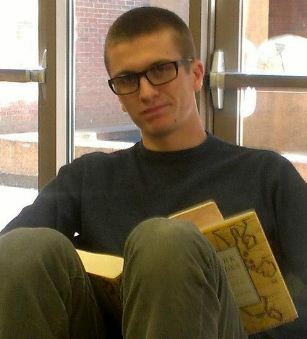 I don’t wear glasses, but if I did I’d wear them when I read, just to look extra brainy. 4. Care and show it. – Pretty simple. I want all the people who are important to me to know so. 5. Open a bit in every direction. – A bit nebulous, perhaps. Promising to open up to people is one thing, but I want to do something a little different than that. I want to try to stay open to new ideas, to making new friends, to newness. 6. Stay positive! – Abe again: “If you look for the worst in people and expect to find it, you surely will.” Pessimism is a self-fulfilling prophecy, and I’m not going to let that be me. These six are my favorites because they encompass the best parts of what kinds of changes I want to make. Self-improvement is a grey area insofar as balancing being sufficiently introspective and being pragmatic, but I think dedicating some serious reflection and effort towards making these kinds of changes can help me to be a better friend and a better person to the people around me. Hopefully at least one of these will resonate with you, too!